Promises of whimsy and nods to the work of J.M. Barrie and to Disney's animated film fly into view with Pan, the prequel to the Peter Pan universe directed by Hanna and Atonement director Joe Wright. With his experience in realizing smart and visually-alluring stories from a child's perspective, the director seems like an ambitious choice in tacking this live-action extension of a beloved setting, also affording him the chance to bring grander Hollywood-scale action to life through his distinctive dramatic lens. 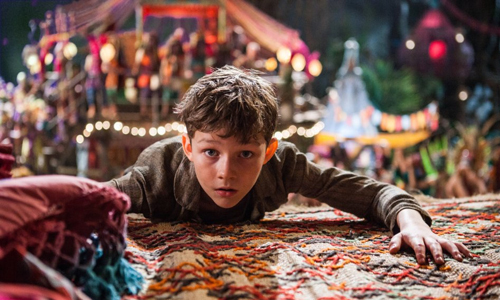 Pan doesn't lack for whimsy, soaring through the skies in digitally-rendered ships as it covers how the titular hero made his way to Neverland, bolstered by fairies and tribal rituals and a particularly sassy villain. What's missing is the right kind of energy required for its intended family-friendly attitude and joyous magical pursuits, resulting in its eccentric performances not ringing as true as they should and its flights of the imagination appearing dreary and unimaginative enough to meddle with the film's tempo. Our story begins by showing how young Peter ended up at a London orphanage, a conventional sight involving his mother (Amanda Seyfried) leaving a note for her son and a token of her affection: a metallic pendant in the shape of a pan flute. Cut to twelve years later, where the boy (Levi Miller) has suffered under the dictatorship of a bunch of angry nuns and lived on minimal rations, knowing next to nothing about his lineage. Abruptly, in the middle of the night, Peter gets whisked away by orphan-thieving pirates aboard a flying ship, with one destination in mind: Neverland. 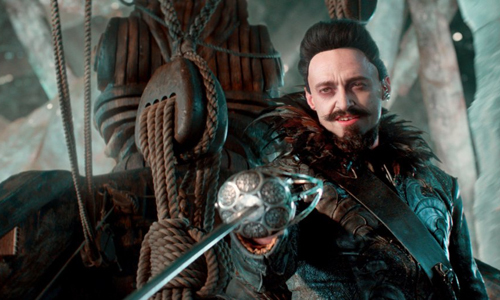 There, at the mercy of the dreaded Blackbeard (Hugh Jackman), Pan's forced into servitude alongside many other young and old men in search of fairy dust buried within the rocks. Peter's defiance, limited knowledge of his mother, and his budding relationship with co-"worker" Hook (Garrett Hedlund) -- a Han Solo-esque rogue -- lead him on a journey that takes him through the mines, the forests, and the clouds of Neverland in search of who he's really meant to be. The script from Ice Age: Continental Drift writer Jason Fuchs bequeaths Peter Pan with a rather commonplace, Oliver Twist-inspired origin, to which director Wright drapes in droopy grays and tans while spinning a yarn about the character's gloomy surroundings within war-torn England. There's a staleness about the sequences, from rebelling over food to the bonding between orphan boys ready to fly to coup, that begins Pan on a lackluster note that it never really shakes off, even amidst gunfights between flying pirate ships and warplanes leading into the world of Neverland. Odd use of exaggerated comedy -- somewhat slapstick at many points -- and a cluster of excessively histrionic performances that could only work in a cartoonish family film stick out like sore thumbs within the destitute surroundings. For a children's film with a lot going on in its beginning, including bomb raids and the aforementioned dog fights between outlandish opponents, it's a surprisingly drab start to the adventure. Wright drastically perks up the color and music in Pan once the commotion arrives to Neverland, but his choice of tunes -- there's an odd riff on Nirvana's "Smells Like Teen Spirit" to get things started -- and his inclination towards a theatrical set-design presence occasionally reminiscent of Anna Karenina conjures a peculiar, surreal cheerlessness. The script swoops in with ties to the known Peter Pan universe, commanded by the not-quite-Captain Hook making his presence known through a charismatic broad performance from Garrett Hedlund, but their integration into the narrative comes across as on-the-nose, necessary filling of gaps instead of adorning the film with familiar charm. While incorporating the mystical realm's ties to fairies and a tribal atmosphere, the film struggles to make connections to other versions of the story that feel organic within vibrant but stagy locations, keeping one from getting wrapped up in the lavishness of it all. Miners squabble, natives gallivant in showy rituals, and Hugh Jackman generates a heavy-handed villain with devious motivations, yet it all moves along without the magic touch that'd give it a life of its own. Part of that boils down to Peter's title as a "chosen one" and how it propels his journey toward becoming the flying boy of legend, which feels like a rehash of many other family-centric fantasies in a story that's already on a destined path. Pan comes across as if it's going through the motions, from the symbiotic partnership between Peter and Hook -- one coming of age and dealing with prophecy; the other struggling with overly wayward tendencies -- to their budding relationship with the oddly-chosen Rooney Mara as Tiger Lily, whose minimalistic poise gives the empowered native girl an uncomfortably rigid presence. The purposes behind their growth as characters are weighed down by persistent, albeit good-intended reminders of what's to eventually come of them, all while struggling underneath this mundane scripting tailored for younger audiences and the eccentric performances that accompany it. The story progresses as if born of obligation instead of a desire to tell a unique spin on the mythology. The brassy final act in Pan navigates through bountiful digital effects throughout the fantastical setting, chock full of vibrant makeup, ornate costuming, and admirably vigorous fight choreography befitting a blockbuster. It's full of enough activity to keep the senses engaged as the mysteries of Neverland materialize -- connecting Peter's lineage to the realm's deep fairy history -- with director Wright breaking from the smaller-scale bouts of action from his previous works to orchestrate proficient epic-scaled gravitas surrounded by intricate computer wizardry. In the process, however, his voice as a director fades within these necessary demands of this boisterous conclusion and the destination that it's supposed to arrive at, resulting in a fairytale that lulls one into indifference instead of rousing them into believing in the sights and sounds surrounding the young hero.